My name is Andrew and I am a creative director and founder of VISIGN production house, where we create captivating visuals by means of photography, video and aerial. I’d like to invite you to my brief treatment, where in a few minutes you will see how can we contribute to enhance Addnature offer and attract new customers. This July, my and my two fellow friends and creators are going to travel for at least 15 days around Norway . We want to see all the most famous spots as well as the most remote places of Norway. During this camping-trekking trip we will travel from Poland through Germany, Denmark, Norway up to the Nordkapp and we will return in a similar way. How can we contribute to Visit Norway? As you may see my Instagram account we specialize in creation highly curated and aesthetically pleasing landscape photography and videography. We are certain that we can elevate your brand even higher using our skills. To maintain cohesive feed on your social media we would like to offer you as well retouching of your future photos both for Facebook and Instagram, so your audience could easily link great content with your brand and amazing services you offer. We would love to retouch a few of your photos right away free-of-charge to showcase our skills. There is so much that can be done in terms of audiovisual content and as we are very flexible we would like to hear your needs to decide what could be the best solution for you. With growing video popularity (video will takeover 82% of entire internet content in 2021 as we write on our blog) we would like to additionally suggest making a promo video which will explain thoroughly your services to audience and new customers. One of the German travel offices - itravel.de - created a series of 10 films to showcase their most prominent destinations which gave them a fantastic buzz over the Internet, increased their credibility and help to explain to their audience why they want to visit those pleces. Below you can see some of the moodboards and inspirations for content which could be done for you. Now, I’d like to take you on a short trip through the most recent content. We thrive in creating landscape and travel photography and film both on land and aerial. Here you can see our 2-minute travel film created in late 2017, where we wanted to show the chaotic and diverse nature of the beautiful county of Thailand. On the right hand side you can check our 30s spot for Lesser Voivodeship of Poland - Made in Malopolska. Last year we returned to Thailand with even more love to photography and film. 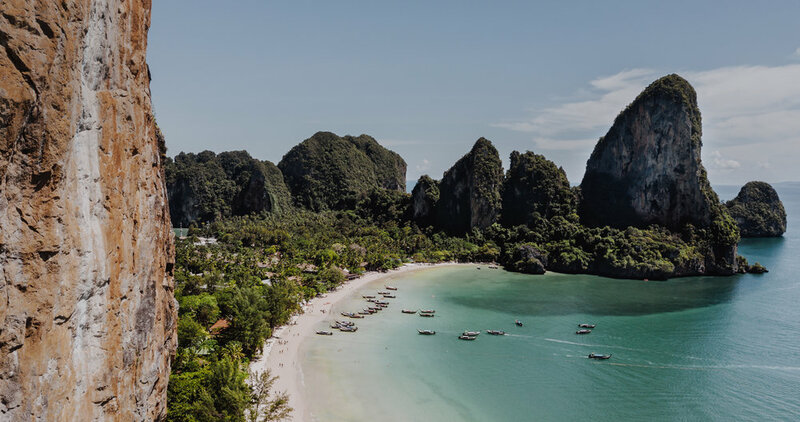 Below you can see some of the photographs showing Thailand’s most interesting spots we encountered this year. We have been featured on several industry websites and recently our drone photography have been appreciate around a few platforms like Unsplash. Among others, recently we won a 1st place in drone photography contest held by Flyandfilm.pl. and DJI ARS. Here you can see some of ours appreciated, moody photography examples. We would love to partner with you. Let me know if you are interested in details about our offer.